Kralov Med is one of the best beekeeping places in Bled and known for having a long history of beekeeping and honey harvesting in Slovenia. The place is surrounded by beautiful farmlands that are easily accessible by car from anywhere in the city. The experience offers you a closer look at the working of bees and how beekeeping was done in the older days. These activities take place in large colored buildings to maximize efficiency. 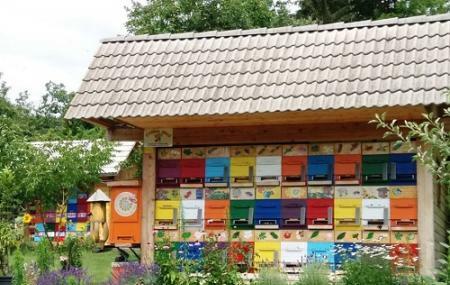 Deemed as a folk art, the practice started by old people to protect bees and represent nature. Great for an educational tour for children. Those who are particularly interested in the city’s culture and history must definitely come here. Well worth taking a guided tour with the owner. Very informative and insightful experience. You can also buy local honey and bee products. A good explanation of the beekeeping trade. Lots of stuff to see. At the end a small tasting session of honey. Most exhibits are translated in several languages. Abbiamo acquistato un sacco di miele perché davvero buono! Lo abbiamo scelto dopo che l'apicoltore , davvero cordiale, ci ha fatto un mini tour con assaggi e spiegazione dei suoi alveari bellissimi e coloratissimo! Consigliato per gli amanti del miele e per chi vuole imparare qualcosa di più sulle api! Adatto anche ai bimbi.